31 years after the release of the american cult-classic “Overboard” the seemingly inevitable remake has arrived into theatres bearing the same name and relatively same plot. The new film attempts to stand apart and make-new from its predecessor with a fusion of American and Spanish culture, along with a gender swap of nearly every single character and a diverse cast. On paper this may sound like an idealized concept as modern day remakes are often diversifying themselves and “keeping up with the times;” however, whatever this film was attempting to do fell flat on its face. The film came out as a cash-grab directed towards lovers of the previous film. Those who’d never seen the original in the first place have no idea what they were missing. For clarification: the only spoilers here reside if one hasn’t seen the video-trailer of the film. Remakes of older films seem to come out more and more often these days; it was only a matter of time before someone like Rob Greenberg and Bob Fisher got their hands on the beloved original and twisted it into one of their own raunchy films, like Greenberg’s “We are Men” and Fisher’s “We’re the Millers.” They’re screenwriters who aren’t exactly well known for outstanding cinematic products. What is a “cash-grab”? The best known definition of the term would be “A product designed primarily or solely with the intent of generating profits.” One might as just define it by listing this film as an example. This new version of the star-crossed lovers of a rich and poor borrows so heavily from the source material that one might argue it can only be liked for the nestalga one feels for the original, but nostalgia doesn’t make it a good or even decent film. Playing off this nostalgia is weak play for any film, as it’s reminding you of something one admired or loved and tries to confuse the audience for that love or admiration without creating it itself. For example, this stolen nostalgia comes from several key-scenes and plot devices stolen from the 1987 version. Any remake will always lean on the source material, but this one mascardes in it like film-identity theft. What makes it stolen is that the remake is exactly like the original but executed in a bone-dry, rudimentary way. “Bone-dry and rudimentary? How?” One might ask, to which the obvious response would be to take any scene which mirrors the original and notice how the scenes are drawn out while minor scenes which are meant to connect them are rushed to a point where the film is yanking its audience back-and-forth to the point it’s almost nauseating. Not to mention how the delivery of lines of the simplest dialogue are so unnaturally delivered or also taken from the 1987 film but butchered in the same way. If one remakes a movie and wants to reuse lines from the original, don’t butcher them and make it sound as if Alexa or Siri said them, or maybe one’s three-year old. The biggest difference between remake and the original is how heavily the remake implemented and included more of a non-caucasian cast. The male star (Eugenio Derbez) is hispanic and more than half film’s characters are. It’s good to see a film doing what it can to diversify in today’s modern age as on paper it’s a very good thing, but the end result is extremely stereotypical and disappointing in its portrayal. These stereotypes exist for the film’s comedic effect, and as such most of the hispanic cast are quite uneducated, some characters being very lazy, lacking a higher education, and are sometimes shown as buffoon-like characters. To defend the film slightly, it’s obvious that there were attempts to justify their use of this as there are the characters who are themselves stereotypes seem to acknowledge the fact in-character. One of the film’s proudest moments is in the ladder half as Derbez’s character: Leo (after working honest labor) now understands the back-breaking work and attempts to convince another character to change certain methods of their business. This can be seen as a good message about working-class individuals and advocating to improve working conditions, however, this kind of message is completely diluted by the raunchy, drawn-out, poor humor. What’s the most unbelievable about this film is how the writers could completely overlook how the two stars lack any sensible measure of chemistry, the two stars being: Anna Faris and Eugenio Derbez. The 1987 original were lucky enough to have stars Kurt Russell and Goldie Hawn, who were actually in love off-screen, so on-screen when we saw Dean (Kurt Russell’s character) begin to fall in love with the woman he conned into being his wife, we feel that his acting and performance is believable; that the love is believable and genuine, which gives a performance much too generous for it’s story. Them it comes as no surprise as the star of the 2018 film: Anna Faris, if anything, delivers the most pitiful excuse of resembling love towards her co-star, a performance, which, results in all of the acting feeling forced and unnatural. “It’s just a comedy, what do you expect?” One might say, well, generally good comedies don’t have poor-acting; if anything their acting is generally superb and doesn’t distort the reality of the film itself and take the audience out of the experience. It’s not to say that the 2018 version of “Overboard” didn’t have its moments; there were at least three good laughs ( coming from scenes that were stolen from the original). he original worked for its time and it wasn’t a masterpiece, but whatever direction the remake is going for is unclear and it’s unsure at this point if there was a direction at all. In all fairness the film alone does a mediocre job at portraying a love-story in some regard, one might argue for it, stating that to really judge it one must set it apart from what it’s remaking. What makes this point invalid is that the film itself isn’t really trying to distinguish itself either, the film uses the nostalgia, humor, and plot of the first and just throws in characters at random to the point that the film feels like a parody of the first rather than a proper remake. It feels like Amy Schumer would create something similar to this and it’s disappointing as one out of the three screenwriters for the 2018 version was Leslie Dixon, who wrote for the 1987 version. 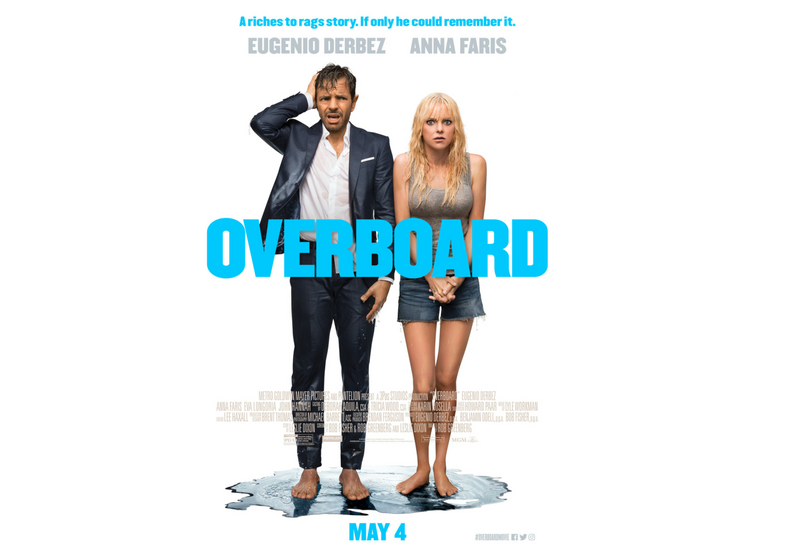 The 2018 remake of the 1987 film “Overboard” can easily be described as a lazy, cash-grab, garbage film with poor acting, poor humor, and consistently uses the predecessor as a crutch and barely makes an attempt to be different outside of a stereotypical, weak portrayal of the hispanic culture of which it so haphazardly implements. The 1987 original, while it may have aged and become dated, still holds up to the remake without a shred of injury and if one’s seen the newer film, it’s best to check out the source material and see what they’re missing.